I recently had the great opportunity to travel to Colorado for a week and it came just in time. It’s been a busy year. Just like most of you, our daily lives have a way of dictating what we do with what little free time we might have. Our jobs, family responsibilities, quality time with the family, chores and even the time it takes to walk the dog, all eats away at our limited free time. For me, it’s been all these and more as to why I haven’t shot and posted as many photos as I had hoped to this year. I felt like a fish out of water. Then came Alex. My friend Alex Santiago asked if I wanted to travel to Colorado and visit some of the national parks in late September. 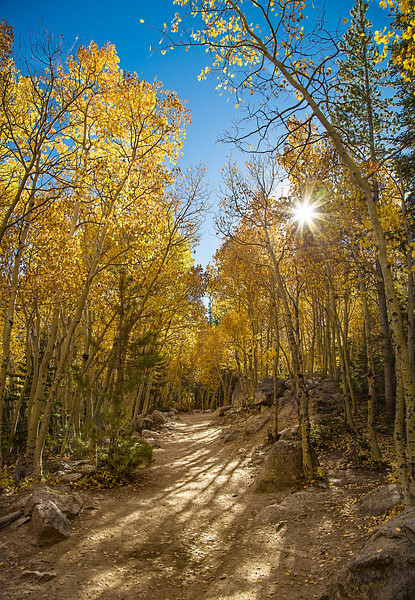 We would be hitting “color week” when the aspens turn gold. There was only one correct answer. I’ll share some stories of our trip in future posts, but suffice to say that it was a super week and we had a great time. I have always had a love for the mountains, and this trip only solidified that desire to go back. While in Rocky Mountain National Park, this view along the one mile path to Alberta Falls was the norm all morning. Gold was everywhere in the mountains.